Host’s note: You will notice that Art Gelwicks stopped speaking about 13 minutes into this week’s ProductivityCast about the GTD step, Organize. Unfortunately, there were technical difficulties. Our apologies for any parts where it may sound like we jumped from segment to another; it’s likely where Art was speaking and his audio wasn’t available. That said, this is episode three, on Step Three of the Workflow Diagram / Map, Organize, in our nine-part series on the Getting Things Done (GTD) personal productivity methodology and eponymously-titled book, from the perspective of the ProductivityCast team–as long-term practitioners, critics and observers of GTD. In this cast, we cover how and where to organize after clarifying items in our inboxes, so that we can effectively trigger next actions when we have discretionary time to make progress on our projects and tasks. Are you ready to manage your work and personal world better to live a fulfilling productive life? Then you’ve come to the right place productivity cast the weekly show about all things productivity here your hosts, Ray Sidney-Smith and Augusto Pinaud with Francis Wade and Art Gelwicks. Welcome everybody to productivity cast the weekly show about all things personal productivity. I’m recently Smith and I’m joined with my co host goes to pronounce. How’s it going to gusto. It’s going to. Well, good morning. doing pretty well, so far? Guys? How about you guys? I am doing well. I glad to hear you’re doing well. And we’re going to hope that our listeners are doing well. 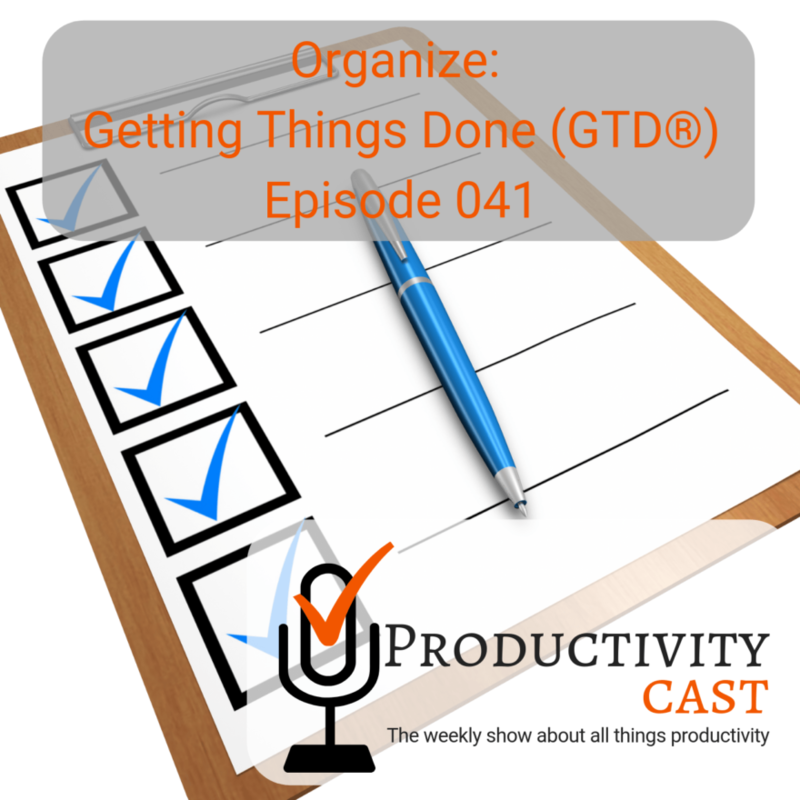 And in this cast, we are going to talk about organizing, and we’re going to be talking about it in the GTD flavor getting things done by David Allen flavor in this series that we’ve been ongoing. And we’re going to talk about the idea of what is organizing? How do we define organizing, at least in the context of getting things done? Well, then talk about how each of us organizes our projects, next actions and other items, whether that be in a traditional list or otherwise. And then we’re going to talk about some of the challenges that we know people face in getting organized in GTD and then maybe how to overcome them, or at least commiserating with you about the travails of getting organized and GTD. So let’s start off with the definition of getting organized. David Allen basically says, He says, having a total and sing I’m quoting now out of the book, having a total and seamless system of organization in place gives you tremendous power, because it allows your mind to let go of lower level thinking and graduate to intuitive focusing on distracted by matters that haven’t been dealt with appropriately. But your physical organization system must be better than your mental one, in order for that to happen. So being organized means nothing more or less than where something is matches what it means to you. So that’s getting organized, and David Allen’s definition and I’ll add a little bit more here to this art. And then I’ll turn it over to you in the sense that I was recently reading an article by Francisco SES, who is the proprietor of facile things, the the software, the GTD inspired software manager, and he starts off his article here with something that’s actually very salient. He says, quote, while some people believe that GTD is a personal management system, somewhat complicated to implement. The truth is that it’s extremely simple, technically, it’s just about managing lists. And that’s something that is available to all of us lists let you capture an inventory of all your activities and review it when necessary, and quote, so in essence, Francisco is absolutely right. David Allen is basically saying here that what you want to do is to be able to have a an external physical system, whether that’s physical or digital, but basically an external system that should be airtight so that your your mind can relax. And it is really all about managing lists. not going down the rabbit hole of everything having its own spot, really thinking about like the the Chinese herbalist medicine cabinets, where every little thing has a drawer that’s almost to a level of minutia, where it becomes unmanageable to. So to me, the organization is if you need something, can you get to it, can you find it without increasing your stress or your work, but even that, that’s I don’t know that that’s necessarily a good definition. What am I saying, for me to be able to put the things in the place, I’m going to find them what I need them, if that makes any sense, is how you’re going to get all that input and put it in a way that you are going to be able to find it in the easiest and most effective way when you actually going to need it, to do something about it. Right. I think the great example is Sean Acker in his book, and the the name is escaping me now. But I’ll put the link in the show notes. But he talks about this idea of being able to, and this has been a long kind of rubric for many people, which is, you know, you put out your gym clothes in the morning, so you kind of stumble over them, you can’t miss them. In the morning, when you have your clothes stacked right next to your bed, right, you put it on a chair next to your bed, on the floor next to your bed. And when you get up in the morning, they’re there at your feet. So you’re ready to get dressed. In essence, that’s a list it’s a trigger, right? It’s, it’s basically you’re incapable of missing it, you know, unless you learn to levitate, you shouldn’t be able to see your clothes sitting there in front of you in the morning. And what you’re kind of all talking about is the idea of doing that consistently across your entire world. So that you are you have it available to you when you need it where you need it. Additionally, when I when I talk on coach and work with people, and they will die, the organizing part is difficult. I tend to tell them, well, let’s change the perspective on this and think that being organized. It’s really a gift you’re giving to yourself. Because you don’t organize this stuff that yes, is to find it on the on the moments you needed the most just so you can be happy. Yes, is looking at you know, if you pick that example is looking at your calendar the night before and saying, geez, tomorrow, I have a really packed day. And unless I do my exercise first thing in the morning, it’s not going to happen. Then you real quickly reorganized that. But being organized at the end of the day is nothing than a gift you’re going to give to yourself or your future self in this case. Because the reality is though things that you’re putting the system are you want to do it or you need to do it. And what better thing that been able to accomplish that on the best place, you know there is nothing more exasperating. And this has happened to everybody that goes to the grocery store gate, get back home and discovered you forgot milk, okay, because milk was not in the list because you haven’t process or because you never write it down. And it is extremely frustrating. So you need to change that perspective that it’s not that being organized is hard or difficult. Or it’s a kind thing that you are giving to yourself as a gift that you are given to yourself. And when people see as opposed to people who is you know, against this organization concept. See it from that perspective, instead of from the waste of time perspective, then there is something that change about organizing themselves. agreed. The other thing agreeing with was art that happened, even when it fails after you change the perspective and then organizing comes to be an active routine. And so then it’s an active routine, you know, the, the list if you use the David Allen definition, you know, get out of date before you finish updating them such that’s how, but it’s the you gain the ability to, to get back into that mythical place of or do you feel that you have given them yourself that you feel that you now know what it is, and even the things that may fell out of the cracks and they do sometimes do know how to quickly recover so you can move forward. And the other thing that tend to happen is window, things fall through the cracks in general are a lot less critical than when you are not organized and you can do a lot better with on expected things. You know, I are sharing between us, you know, last night we’re driving back home on a tire blow out. So that is a problem. Yes. Is something we need to take care. Yes. But having that organization allows you to see everything that is in there and allows you to then make a decision about what you will need to renegotiate what you will need to push back what you will need instead of saying oh, well, okay, that’s fine. You know, let me just add another thing to the overwhelming I already had for Monday morning and dad really makes a difference. You all bring up really great points here. And I wanted to actually touch on this. I wasn’t planning on it. But I think this is actually very pertinent for us to discuss now. And the two university research professors Francis highly and inclement Vito published a paper called Getting Things Done the science behind stress free productivity. And what they did was they outlined in one section the process and organize phases of GTD workflow charge, or the workflow diagram or map as some people come to know it. And they provide some really fundamental questions for how David Allen really has manifested the system and how, you know, some of the science behind it. But I wanted to just very, very briefly cover the questions that they have for where things get organized. Before we talk about our systems. They, they have this where you collect stuff, which is the in basket, right, and that’s, to some extent, your collection practice that we talked about two episodes ago, then we have the processing functions, which is quite honestly tied to organizing, right? You You have to do all of this work that we talked about in the last episode. And we talked about how we think about what the things are, and the side the actions are projects associated with those things. And then they give us these questions. And so they say, if it comes into our in in basket, and we say, does it require action? And we say, No, we then need to ask the question, is it worth keeping? If it’s no, it gets eliminated, it goes into trash? If we say yes to that question, we then asked the additional question, could it require action later? If the answer is no, it goes to reference? If the answer is yes, then it goes to someday, maybe. And then we have to then put it in someday, maybe, and cue it for some other time for us to be able to reconsider it, because now it’s in incubation. Right. It’s being incubated and now needs to be that that’s the one side of it for does it require action know if it says, Does it require action? Yes, is is there more than one action needed, we determine the next action. If that next action will take less than two minutes. David Allen says to do it. Now, that means we’re not we’re not putting it anywhere, we’re not organizing it anywhere, because we just it’s more work to track it, stack it and maintain it than it is just do it right now. So we go ahead and we do it right. Now, if the answer is no to will it take less than two minutes, then? Is it Am I the right person to do this? That’s the question. We then ask if the answer is no, we say delegated. And that means that we delegate it, we’d make the affirmative action, then we go ahead and put that item on our waiting for list. Now, we then have to, of course, monitor that list to make sure that it gets done, but we put it on our waiting for list. If the answer is am I right? Am I the right person to do this? Yes, then we defer it. And so now we’re going to organize that to either our calendar or next actions list. Okay. And we’ll talk about the difference between what goes on a calendar what goes on next actions. Now back up at the top again, to does this need more than one action? If we say yes to that question, then that goes to our projects list. And then we go ahead and do the necessary planning, and then we determine the next action and we come back to the what’s the next action? Will it take less than two minutes, am I the right person to do this, etc, etc? Well, I’ll place a link to this in the show notes. And it’s page five, the the flowchart that they’ve provided here, I think it’s very, very useful to go through this mechanism, actually, to have it just handy while you are organizing, because it gives you the appropriate questions to build the skill of organizing properly, because it really does, it does make a difference to be able to clearly know the questions to ask yourself at different parts of it, I wanted to kick into how each of us actually organizes and maybe going through our own systems. In terms of these things. Let’s talk about difference between organizing actions in the calendar versus in lists. Now, many people have a misunderstanding, there’s a misunderstanding about what a calendar is, okay, so a calendar is a list, it just happens to be a list with a different view. And like many calendars, software, and physical, you know, analog calendar tools, you can have an agenda where the calendar looks like a list, you know, hour by hour, you can have it by day, week, month, you can even have a year long calendar view. But the point is, is that a calendar is just a list of date, times, and a description of what is going to happen at that date and time. So a calendar is a list just like any others, but they happen to be what David Allen calls the hard landscape, because you can’t change time, only the things that you do in that time are fungible, but the time itself is not. So how do we decide the things that go into the calendar versus those things that go into other lists. And David Allen gives us three categories. And then I’d like to hear your your, your thoughts on this gentleman. But he gives us three categories. One, of course, our actual appointments, meetings, places where you need to be somewhere at a date, specific time and location to our actions that require you to do something at a specific date and time. So if you need to call the DMV between the hours of 830 or 930 on Tuesday morning, because that’s when they told you to call you back, then that’s when you need to do it. And therefore, that should go in your calendar. Then the third item is reference items that you need on a specific day. And he gives typically, the example I believe, of the example he gives his, you have an airline booking ticket, you know, an airline booking number, and you need to go ahead and take that flight number that that that ticket number, and you throw that into your calendar as maybe an all day event that doesn’t take a whole day, but you know, just available to you on that day. So you have it available to you when you need it. Because that’s easy access least in terms of a digital calendar system, I suppose that it would work also in an agenda, right. Because if you just flip over to a physical agenda book, and you have your flight number, and your, you know, flight confirmation code written there at the top of the day, then you have added easy access. So this is the time we get to talk about our how we organize, I’d like to, to spend some time talking about how each of us organizes the were in the how of organizing in GTD and so I’ve been doing this since 2001 over the past now 17 years, I have been organizing my projects, next actions and the other items whether that be referenced someday, maybe, and so on, so forth. And this has this has been a very long road with many small derivations to this end point. So for those of you who are listening, don’t expect to get to this point overnight, it really does take time to hone and technology changes. So unless you are literally using an all paper system with just paper and pen that something will change, and therefore you’re going to need to adapt to that over time. So the system I say, we we all talk about today may not be the case tomorrow, because as a tool might go under, you know, a tool might lose a feature that is a fundamental feature that we absolutely need, in order to run our GTD systems or other other productivity systems, etc, right? Any number of things can happen that will change the so do not consider any of these, hey, a template or consider these a an examples that you can pull flavors from, you know, it’s it’s, it’s for you to be able to pull ingredients from and and hopefully those ingredients will spark new recipes for yourself. So at least from the hard landscape perspective, my Google calendar is my hard landscape tool. It’s my time management tool of choice. And that’s just because of its pure ubiquity, you know, I can access it anywhere because I use g sweet for business and Google Calendar personal or Google in personal life, those to connect very well together. So I can seamlessly integrate my work calendar and my personal calendar in one view, whether I’m logged into my business account or if I’m logged into my personal so it makes it very, very helpful on the projects next actions and other items. Let’s start with reference because I think that ends up being kind of the hub for me. So I use Evernote as my as my reference hub. And Evernote does many other things for me, right, it handles many other productivity systems within my world. But just relating to reference, I do that because it has tight integration with my task manager, my project management tools and Google Calendar. So what I’m capable of doing is tracking my next actions. And remember the milk and remember the milk a gusto was talking about, you know, forgetting milk when you come home from the grocery store. Well, remember, the milk is kind of based on that idea, right? That’s where its name comes from. And the idea here is that Remember, the milk integrates with Evernote and so I’m able to track my next actions in remember the milk and if I if I capture something to Evernote and it isn’t it is action based, I just need to click on my integration with remember the milk and the Evernote note becomes a task item in remember the milk in my inbox, right. So now I can go ahead and organize it appropriately and remember the milk. And then I also use a sauna and cello for different parts of the business. So some projects are in a sauna, some projects are in tullow. And that’s just by virtue of my client base and how company developed. So that’s what we do. And both of those Of course, integrate with Evernote which means that they integrate through Evernote to remember the milk. And so that’s how I actually keep everything synchronized today is that it’s that it’s that connecting peace between having those notes, attaching my projects from a sauna and cello into Evernote. And then the projects list is actually managed in remember the milk. So remember, I track all of my actions. And remember the milk a sauna and trial are for project management. And therefore I’m only keeping my team apprised of what I’m doing in one of those tools. I am not tracking or managing tasks in those tools. So when I’m ready to do something, I’m always going to remember the milk in order to be able to do to engage. Because if I were trying to look in a sauna and cello and everywhere else that things could possibly be that’s going to diffuse my focus and I would not be able to get as much done. And then finally, I did want to talk a little bit about I do organize my my brainstorming material to mind maps, typically either paper or digital. And so I use mind 42 which is an online tool. It’s a very simple online tool and I pay for the tool to get rid of the ads in the interface but it’s completely free otherwise you can you can use it free with the ads and and i don’t think it would be that disturbing but I just wanted to support the project. And so mind number four, the number two.com and it’s fantastic I really I really enjoy using it and it imports and exports to many different formats so that you’re able to upload and download locally. If you need to work offline you can use it a download a free mind management tool like free mind which is an open source project and you go ahead and you know, download it from mine 40 to work on it offline and free mind re upload it from free mind back into mind 42 you’re good to go you know so you have a lot of flexibility with regard to mind mapping but I do organize my brainstorming within the mind map and then I usually will export that brainstorming mind map into my project plan in Evernote and then that becomes the project and so it becomes very easy for me to connect project support and or a project within the notes of an Evernote note and linking that back to my remember the milk project later. it cloud as your as your hub. For the calendaring system. I wanted to talk very, very briefly before we go into challenges about some of the fundamentals of of actions, lists and projects lists. Because we we talked about our systems. And I think it’s important for us to recognize that there are other other parts and I don’t I don’t want this to be a treatise. So you know, I tried to stay steer our agenda away from from that. But you know, we do have some fundamental pieces that we didn’t talk about, right, the someday maybe list the project plans where those things go. And, and we talked a little bit about waiting for, and so and so forth. But I want us to hone in on the next actions list. And the projects list for some very key points here. David Allen talks about the idea of using categories, whether we call them contexts or otherwise. But categories for breaking our actions lists into into those categories, right. So we have multiple lists that that create our next actions lists. We don’t have just one list, we have many lists and GTD and in the next action space, we have even more lists and they’re broken up into some common ones. And he gives these common ones in the book I’m reading from the march 2015 edition, he says, calls at computer errands at office at home anywhere agendas which are for people in meetings, read slash review. So he gives here eight common lists to have as next actions lists. it’s much faster to have a context call at Excel, where you are just going to tackle everything that require you to think on on a spreadsheet format, then go from different items, and then go from one software to another to another one. Because will allows you to keep that perspective of what you’re doing an Excel to tackle stuff a lot more faster, I’ll be the I’ll be the GTD apologist at the moment. And and, and make sure that I do knows that David Allen actually covers this in the book. And he does say here, you’ll probably find that at least a few of the following common list headings for next actions will make sense for you. And he does go into into detail about each of these lists and how they might be practical for you. And this is a list to cherry pick, this is not you should take these eight categories and put them into your system. And then voila, you’re ready. And I can impress upon people enough the importance of modifying a system to meet your specific needs. These are suggestions that he makes in the book. And he then he makes ideal principles we don’t live in a an idyllic world, we live in the real world. And so take his ideals and adopt them as ideals that’s important. And then take his suggestions for things and cherry pick the things that work for you. And that becomes your GTD system that doesn’t become anyone else’s, it is a very bespoke, very personal system that you’re developing. And I think it’s really important that we all take that to heart and I know that both of us to an art understands that, but I just wanted to make sure our listeners did did hear me say that so that no one no one writes angry emails. Um, alright, so moving along, I want us to talk a little bit about the projects concept. And, and then I want to very, very briefly touch on the challenge that art was talking about. Because I think it’s, it’s a, it’s a very good one for us to have a conversation about. you know, like art, I have checklist for organized my organization. And the reason for that is I’m trying to be kind with the non so intelligent part of myself, for example, I have a list for when I travel everything that should be in there. I could I think about it every time Yes, I can. But the reality is that it’s helped me to be a lot more organized and a lot more prepare that instead of thinking every time I’m going to travel Okay, what I need to carry know just pull the list and do it unlike that I have a list for when we get our daughter to the swimming competitions, when there is a lot of things that contain those checklist to make sure that the organization is organization I have to this day I quickly review checklist. Why? Because I want to make sure because regardless what is my level of exhaustion or tiredness or not, okay, or awareness, I go uncover every step. What those things allow me to do is to organize in a simpler way, if you need to have the things on 10 places or a one place doesn’t matter as far as you are making sure that one you’re checking them. And second, all those 10 places make you more productive. The problem comes when you have all those I mean, instead of be more effective or more productive or more organized. All that you are doing is busy work. This has been a fantastic discussion. Thank you, gentlemen. In closing, I just want to make sure that we are next week we are talking about the review and reflection area of getting things done. So in the next episode, look out for us in our discussion about reviewing and reflecting within the GTD methodology. This is going to be a really fun discussion, I think, very informative discussion, because I think there’s a lot of material here where people sometimes get conflated with what is the weekly review and that which is just review and reflection. And while the weekly review is a fundamental piece, we’ll talk about that in its own separate episode, we really are going to get into the details of reviewing and reflecting So do you have a question or comment about this cast or something we discussed. If you’re listening from anyone from anywhere other than the podcast website, we invite you to jump over to productivity app dot net forward slash 041, the episode number there at the bottom of the page, you can go ahead and leave a comment or question one of us will be glad to respond here on productivity cast.net forward slash 041, you’ll you’ll find the show notes. So links to anything we discussed are easier to jump to from the show notes and you can learn how to subscribe to the podcast on the website. So that’s great. Do you have any? If you have another question about personal productivity, please visit productivity cast.net forward slash contact and you can either leave a voice based message or a text based message and that’ll shoot out to us and we’ll be happy to respond either to you directly or if it’s pertinent here on the show. Thanks to a goose, Joe and art for joining me here on this cast. And if you could please add a rating or review on iTunes or Stitcher for kudos and to help us grow our personal productivity community of listeners. So thank you. That brings us to the close of this episode of productivity. Cast the weekly show up all things productivity, thank you art and gusto for joining me here today. And that’s it for this productivitycast the weekly show about all things productivity with your hosts Ray Sidney-Smith and Augusto Pinaud with Francis Wade and Art Gelwicks.